Because graphs built by Chartist.js are created using vectors, they are fully responsive to your visitors’ screen sizes and will automatically match your visitors’ screen resolution. Chartist.js is built with and supports code written for the SASS CSS preprocessor. Using CSS @media queries, Chartist.js supports creating different graphs for different screen sizes. For easier control than manually writing @media queries, the library also offers an easily-implemented mechanism to specify graphs for different types of devices. With these settings, the library supports both traditional and mobile-first designs. For mobile devices for example, Chartist.js can show fewer labels creating a more easily read graph. Accessing elements within graphs created by Chartist.js is easily done through the HTML DOM, just like any other element on your website. 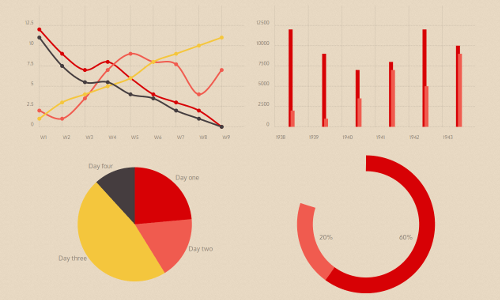 Because the graphs are created using SVG, every component of the graph is accessable and editable.